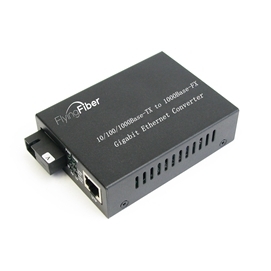 FlyingFiber’s 10/100/1000M adaptive fast Ethernet optical Media Converter is a new product used for optical transmission via high-speed Ethernet. It is capable of switching between twisted pair and optical and relaying across 10/100/1000Base-TX and 1000Base-FX network segments, meeting long-distance, high-speed and high-broadband fast Ethernet workgroup users’ needs, achieving high-speed remote interconnection for up to 100 km’s relay-free computer data network. With steady and reliable performance, design in accordance with Ethernet standard and lightning protection, it is particularly applicable to a wide range of fields requiring a variety of broadband data network and high-reliability data transmission or dedicated IP data transfer network, such as telecommunication, cable television, railway, military, finance and securities, customs, civil aviation, shipping, power, water conservancy and oilfield etc, and is an ideal type of facility to build broadband campus network, cable TV and intelligent broadband FTTB/FTTH networks. 1). In accordance with Ethernet standards IEEE802.3, 10/100/1000Base-TX and 1000Base-FX. 2). Supported Ports: SC for optical fiber; RJ45 for twisted pair. 3). Auto-adaptation rate and full/half-duplex mode supported at twisted pair port. 4). Auto MDI/MDIX supported without need of cable selection. 5). Up to 6 LEDs for status indication of optical power port and UTP port. 6). External and built-in DC power supplies provided. 7). Up to 1024 MAC addresses supported. 8). 512 kb data storage integrated, and 802.1X original MAC address authentication supported. 9). Conflicting frames detection in half-duplex and flow control in full duplex supported. 1). For intranet prepared for expansion from 100M to 1000M. 2). For integrated data network for multimedia such as image, voice and etc. 3). For point-to-point computer data transmission. 4). For computer data transmission network in a wide range of business application. 5). For broadband campus network, cable TV and intelligent FTTB/FTTH data tape. 6). In combination with switchboard or other computer network facilitates for: chain-type, star-type and ring-type network and other computer networks.